5. 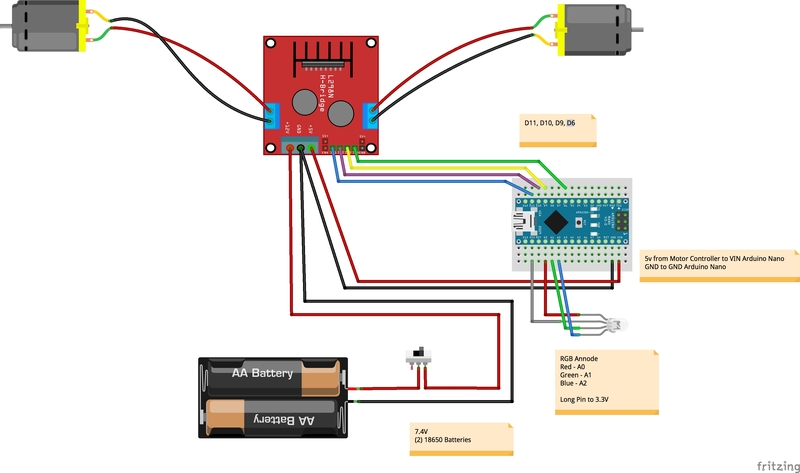 Connect your Arduino Nano via blue USB cable provided. (make sure you have disconnected VIN cable before connecting USB cable). The wheels and RGB LED will respond as per code. If it does not, check all the jumpers and look at the code listed below. If the motors spin in the opposite direction you can either switch the jumper or switch pin assignment in the code below. // Pin Outs for Motors. // Please note that if your polarity is different reverse your pins on the Motor Controller. How do you change the colors of RGB LED? Can you make only 1 wheel spin? Can you make spinQ turn left and then go forward? In the next class, we will add a remote control and sensors and study the code in-depth. Thanks to Karl Wendt for your support.